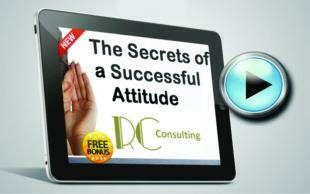 Knowing the secrets of successful attitude is one of the most important skills in any profession or industry. OpenSesame’s Course of the Week, Secrets of a Successful Attitude by Rosey Conway, demonstrates how soft-skills can be effectively taught online. Packed full of video tips, activities, exercises and strategies, you have 20 years of training experience at your fingertips! Best of all, participants create their own personalized “Attitude Success Plans” that they can print out upon completion. This could be one of the best coaching and management tools available for the price! Founders of huge companies, professional athletes and successful parents all share the same quality: a successful attitude. People who tell you they don’t like your attitude or that you should change it, rarely tell you HOW to. The theories and strategies contained within this eLearning module teach you how to manage your attitude, setting you up for success. Each of the 7 secrets of success are explored in detail with activities and exercises to illustrate points, and learners create their own unique 7 personalised strategies that they can apply in their own life! Upon completion of this course, you will receive your own personalized “Attitude Success Plan.” Print your own success plan out and stick it up on your fridge at home or at your desk at work. Want to get our Course of the Week delivered directly to your inbox? Please let us know.